My name is Mairead Clabby. I have been a Special Constable within Merseyside Police for over six years, and a Custody Detention Officer as my full time job for the past year. Approximately 18 months ago, my Mum told me she had read about something called the Mind Blue Light Programme online, and urged me to sign up as a Mental Health Champion. She knew how strongly I felt about championing equality for those with mental illnesses especially as I have had mental illnesses myself. I have also experienced discrimination towards my depression, anxiety and ADHD, and I felt determined to fight for my rights and others’ rights too. I read about the programme, and I loved the idea of championing positive mental health support for emergency services as well as challenging the mental health stigma that exists, so I decided to sign up. Over the Christmas period of 2016 I set up a Twitter account associated with my mental health work, and I wrote an online blog post about my past mental illness. I felt very nervous at this point about sharing that part of my life as I was worried people would see me differently, always view me as a victim or as weak, and I also thought others may pity me or discriminate against me, or view me as less competent. Regardless, I felt it to be a risk worth taking. I felt that by sharing my innermost thoughts, it would show others who may be suffering in silence that they were not alone. It also inspired me to drive forwards with my passions to improve quality of life for those with mental illnesses. In January 2017, I signed up as a ‘Time To Change’ Mental Health Champion. Time to Change is a social movement made up of people challenging mental health discrimination and ending mental health stigma. I completed social contact and events training with them at the end of January. A few days before Time To Change’s Time To Talk Day at the start of February, I noticed our Force did not have any plans to mark the day. At the very last minute, I planned a small event. I set up a desk in the Merseyside Police HQ canteen with resources from my local branch of Mind in Wirral (I used their services when I was depressed during my time at university). It’s unreal how from this very small movement I had many moving, thought-provoking conversations with staff which affirmed my determination to try and improve conditions for police staff, officers, Special Constables and our communities – who experience mental illness directly themselves or via their loved ones, friends or colleagues. The event was also attended by Chief Constable Andy Cooke, and Assistant Chief Constable Ian Critchley. I was especially moved by the support I received from the Senior Leadership Team, and I talked for an hour exchanging ideas with Superintendent Mark Stanton from Response and Resolution Policing about how to retain staff after absences. It came across how much the supervisors in attendance truly cared about their staff and their wellbeing – this encouraged me. It also made me assume that I was also preaching to the converted – staff who do not hold any stigma or ill-feeling towards those with mental illnesses and are willing to always build their knowledge, open to ideas by nature. It was inevitable that I would be met with some resistance. Those who were not in attendance, watching critically from afar, would already be raising their guard to my open and vocal promotion of staff welfare. A colleague who attended to oversee my efforts, stated that in their opinion, “talking is overrated” – on Time to Talk Day! To hear this made me wonder if my efforts would ever be taken seriously. During this time, I was also going through the recruitment process for both full-time police officer and Custody Detention Officer within Merseyside Police. 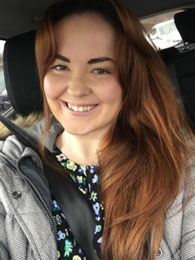 I applied for the Custody role after my police officer role – as I had a gut feeling that my past depression was going to prove an obstacle for me in achieving my dream of being a police officer. I couldn’t explain it – it was just an instinct. As it turned out, it was good sense applying for both. When I got to the medical stage of my application, an independent GP assessed me as fit to be a police officer – however, the Force Doctor raised concerns and referred me to an independent psychiatrist. They also deemed me fit, but due to me having had depression a few times over the course of my life, recommended that the Doctor could defer me for a year, which he did. Fortunately he deemed me fit to start as a Custody Assistant. In light of this, I decided I would make the most of my year, and more than ever after what had happened, I was determined to prove that past illness is not a barrier to success. I became a committee member of the Disability Support Network in Merseyside Police, as well as the National Police Autism Association Lead Coordinator. I was approached by a Community Engagement Unit Sergeant with a view for asking for my assistance with launching a Merseyside Autism Alert Card. I joined the Community Engagement Unit as a Special Constable. During the past year, I attended the National Police Autism Association conference at British Transport Police HQ in London representing the Disability Support Network, and exchanged ideas with other Force coordinators on how to improve conditions for those with autism, autism-related conditions and other neurodiverse conditions in the police service. We were also joined by Cheshire Police Deputy Chief Constable (now Acting Chief Constable) Janette McCormick, who offered great advice on how to make the network and its ideas viable and tangible. During my time in the Community Engagement Unit, I helped launch the Autism Alert Card in Merseyside and arrange autism Awareness training via our colleagues from Autism Together. A month ago, myself and members of the Community Engagement Unit attended Autism Together’s Autism Champion training, so we are now able to cascade autism awareness training to others within the Force. During the past year, I have met with many staff members from Merseyside Police who have approached me seeking help – largely thanks to my very visible and vocal presence on social media – in my capacity as a mental health champion. Each time, I have met with them in cafés and discussed their mental health concerns. The majority felt unable to approach HR or their GP for help – by the end of our conversation, we had made a strategy of how they could deal with their feelings in the here and now and moving forward. More than anything, I was a neutral ear, a stranger, who was there for them and to listen. I remember a Special Constable who I sat with and talked with, who from our conversation basically needed to take time out. They did – and came back a few months later, where I met them at a Specials Awards Ceremony. It was incredibly rewarding to see them thriving. Their Mum approached me in private at the ceremony to say that their son did not discuss their feelings so they felt especially grateful that I had been there for them when they needed it. This reminds me exactly why I became a mental health champion. During 2017, I stayed behind after many days of training to become a Detention Officer, to provide mental health awareness training to Special Constabulary supervisors. I also became a trained Mental Health First Aider thanks to Merseyside Police. I was also filmed talking about my experiences with mental illness for a Mind Blue Light video where myself and other emergency services staff in the North West region discussed their mental illnesses on camera to try and remove stigma. I was also kindly invited to attended a Greater Manchester Police Evidence-Based Policing event, where I learnt about a study examining the effects on detectives who deal with murders in terms of their mental health. I also attended the first ever Special Constabulary LGBT conference in Norfolk and took part in our Liverpool Pride parade. During the last year, I also joined Merseyside Police’s gender equality working group, Parity 21, and the British Association of Women in Policing. I also worked as a Custody Staff Ambassador feeding back staff concerns to supervision. I think in the last year, we have moved forward in terms of improved visibility of mental health – for example, Blue Light and strong role models speaking. In Merseyside Police, I coordinated a Time To Talk Week this year for us with events across the Force. The Chief Constable kindly invited me to appear on his vlog to staff where I was able to promote events such as a free workout for staff at a gym, free mindfulness sessions provided by my father, a Psychiatric Nurse, for response staff, call handlers and HQ attendees, and talks I provided on Mind Blue Light and my own experiences. My Police Officer application also re-opened in January, and I am now starting as a Police Officer in April. I believe that we still have a lot of work to do. You may have seen Project 84 recently – promoted by CALM and ITV – 84 men complete suicide every week and 75% of all suicides in 2015 were completed by men. This is work that can be carried forward as Mind Blue Light Champions and within Parity 21. In my year as a Mental Health Champion, the only policing area I have not had any engagement with is Armed Response Officers. Going back to the above, I wonder if this is related to the anxiety surrounding asking for help with a mental health issue – whether this is associated with weakness or incompetence, and the removal of staff from the specialism they love. I think the only way to keep working towards a workplace where all diversities are celebrated – including mental illness – is by continuing to be strongly visible, by continuing to promote open discussion of mental health in the workplace and by having greater communication and increased bonds between staff, middle management and command supervision. I also think we need to standardise mental health training and approaches to welfare for supervision helping staff to reduce the likelihood of ‘hit and miss’ experiences.